ASG Assembly is helping Q Source celebrate our 30, by giving you 100. Q Source has been an authorized ASG distributor for 21 years of our 30 in business, and ASG is honoring our 30th anniversary by offering Q Source customers $100 off select ASG products at QSource.com. This 30th Anniversary Partner Promo is valid October 1, 2014 through the end of 2014. 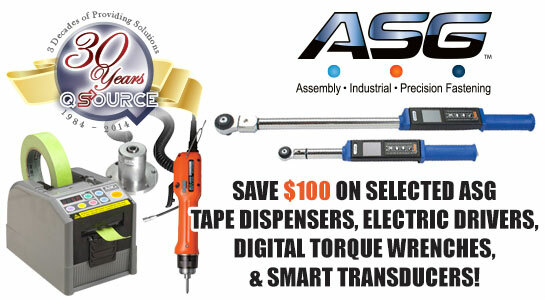 Eligible top-quality ASG items include their versatile EZ 9000 Automatic Tape Dispenser, more than 60 all-around powerful Digital Torque Wrenches, 30 BLG Brushless Electric Drivers for medium-to-light torque applications, and 22 ST Series Smart Transducers, which use plug-and-play technology for ultimate flexibility. All eligible products have currently been marked down at QSource.com; you needn't enter a coupon code to get the discounted price. The ASG EZ 9000 Automatic Tape Dispenser is a compact tool for industrial or commercial use and is designed to fit easily on most workbench/assembly stations. It features two dispensing modes (Preset and Loop), a memory function with six different lengths, and can cut protection film, aluminum foil, copper foil, insulation, and more. Available in standard or wireless models, these ergonomic ASG Digital Torque Wrenches are designed with a durable, ASG Gold Standard quality ratchet head. They feature soft, no-slip handles, high-visibility, full-color LED screens; multiple modes, and 99 programmable presets. These ASG BLG Brushless Electric Drivers (BLG-4000 and BLG-5000 models) are manufactured to ASG’s World Class Ultimate Gold Quality Standard and are designed for light-to-medium torque applications. These lightweight drivers have brushless motors and are made to eliminate carbon dust. Certain models feature cleanroom compatibility or anti-static plastic bodies. ASG ST Series Smart Transducers are manufactured per ASG's Ultimate Gold World Class quality for use in industrial applications (usable on impact tools). These torque testers cover a variety of torque ranges, have a torque accuracy of ± 0.5%, and use plug-and-play technology for the utmost flexibility. For more information about this ASG promo and to make a purchase, please visit our 30th Anniversary ASG Partner Promo page at QSource.com. You may also contact us via our Web site, by phone (800-966-6020), or by email. Remember, this promo expires on December 31, 2014. If there's a product or topic you'd like to see The Q Source Resource write about please let us know. We'd also appreciate if you share this blog post with your friends and colleagues via the social media links below. If you have questions or comments about this exclusive ASG promo, please either leave us a message in the comments section or contact us directly.